Austin Dobson: From verses read at the unveiling, by the United States Minister, the Hon. Mr. J. Russell. Lowell, of the Bust of Henry Fielding by the Sculptor Miss Margaret Thomas in the Shire Hall Taunton. Austin Dobson had it wrong, Henry Fielding does not sleep with the alien Portuguese. 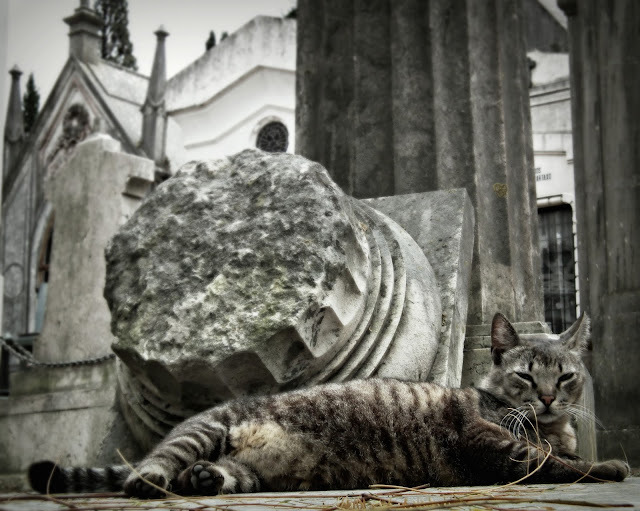 They, católicos to a man, would not be caught dead in the Cemitério dos Ingleses on the Avenida de Álvares Cabral, a heathen burial ground reserved for protestantes, judeus, agnósticos and atheists. He shares his final resting place mainly with his fellow countrymen and a smattering of Germans, Dutch and other northern Europeans. He was born in 1707 in Somerset and grew up in Dorset but he was one of London’s greatest citizens and the fact that he died and was buried in Lisbon does not stop him being one of the London Dead. I had wanted to pay my respects at his memorial for some time, something that should have been relatively straightforward as I regularly visit Lisbon. 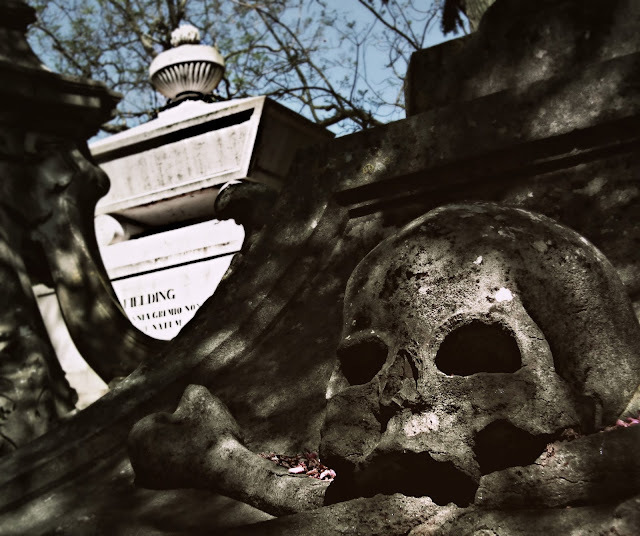 But somehow whenever I resolved to make the trip to the cemetery something went wrong; I missed buses, got caught in downpours of monsoon like ferocity on the streets of Lisbon, turned up in the afternoon when the cemetery was closed, or lost my way in a tangle of side streets and alleyways. This year I was determined to make sure there would be no mishaps and as soon as I was off the first easyjet flight of the day from Luton airport and out of customs I hailed a cab and had them take me straight to the cemetery. Walter Scott called Fielding the father of the English Novel (an honorific Defoe and Richardson might both have taken issue with) and Edward Gibbon said that Tom Jones “will outlive the palace of the Escurial, and the imperial eagle of the house of Austria” (the second part of his prediction has already been true for the best part of a century though the Escorial still stands firm). On the other hand Dr Johnson took Hannah Moore to task when she quoted from some “witty passage” in Tom Jones and expressed his shock “to hear you quote from so vicious a book. I am sorry to hear you have read it; a confession which no modest lady should ever make. I scarcely know a more corrupt work." He also called Fielding a blockhead, and when Boswell demurred furiously elaborated “what I mean by his being a blockhead is that he was a barren rascal!" "Will you not allow, Sir, that he draws very natural pictures of human life?" Boswell mildly countered. Leaving aside his literary achievements (he wrote for the stage as well as fathering the novel) Fielding is best known for his job as a Bow Street magistrate. In this capacity he was notable for his objections to public executions (the public nature of them being the cause of his opposition rather than the execution itself, which, like congress with serving girls, he had no particular issue with as long as it was decently carried out in private), his role in the formation of the Bow Street runners (in the early days, a wholly inadequate force of 6 which has multiplied, over the intervening two a half centuries to 32,000 with apparently little effect on the crime rate), his incorruptibility (in terms of monetary bribes) and his nepotism in job sharing his job over his blind half brother John. Fielding’s first marriage, in 1734, was to Charlotte Craddock at their local church in Somerset. It would have been a completely happy marriage if four of the couples five children had not adopted the habit of dying in infancy and Charlotte, no doubt heart sore and broken willed, chosen to follow them at a relatively early age. There is no reason to doubt that Fielding’s grief was both genuine and profound despite his seeking solace in the bed of Mary Daniel, his wife’s lady’s maid (who since the death of her mistress probably didn’t have much else to do). The liaison was presumably satisfactory in every respect because Fielding decided to make Mary his second wife. They married on November 27, 1747 at the church of St Benet Paul’s Wharf. According to the 1904 DNB “their first child was christened three months afterwards. Lady Louisa Stuart reports that the second wife had been the maid of the first wife. She had ‘few personal charms,’ but had been strongly attached to her mistress, and had sympathised with Fielding's sorrow at her loss. He told his friends that he could not find a better mother for his children or nurse for himself.” Fielding did not share the view that his wife lacked personal charms; during the next five years she fell pregnant every year, only her husband’s ill health finally putting an end to the begetting of further Fielding offspring. By 1752 failing health and premature middle age forced Fielding to resign his position as magistrate and retire to Ealing where the gout and dropsy undermined his constitution so badly that by the summer of 1754 newspapers were reporting his death and then having to print hasty retractions; the Derby Mercury of the 21st June for example “we have the Pleasure to assure the Publick, that the Report of the Death of Henry Fielding, Esq; inserted in an Evening Paper of Thursday, is not true, that Gentleman's Health being better than it has been for some Months past.” Fielding was not put out by rumours of his demise; he was in such a poor physical state that he himself commented that “my face contained marks of a most diseased state, if not of death itself. Indeed, so ghastly was my countenance that timorous women with child had abstained from my house, for fear of the ill consequences of looking at me.” Knowing that if he did nothing the rumours could well become true he decided to leave Ealing and move south to a sunnier climate. He originally hankered after Aix-en-Provence but as gout had left him unable to walk and made carriage rides agony he cast around for someone reachable by ship and settled on Lisbon. On the 3rd August the Oxford Journal reported that “a few Days since Henry Fielding, Esq; and his Family embark'd for Lisbon, in order to use the Baths for the Recovery of his Health; and not for the South of France, as mentioned in some of the Papers.” Fielding had been trying to leave for Lisbon since June 26, the day he left Ealing on an excruciating two hour coach ride to join his ship, The Queen of Portugal, at Redriffe (Rotherhithe). On his own admission he “presented a spectacle of the highest horror. The total loss of limbs was apparent to all who saw me, and my face contained marks of a most diseased state, if not of death itself….. In this condition I ran the gauntlet (so I think I may justly call it) through rows of sailors and watermen, few of whom failed of paying their compliments to me by all manner of insults and jests on my misery.” For the five or six weeks Captain Richard Veale piloted his ship at an agonisingly slow pace down the Thames, into the estuary and then round the south coast, always hugging the coastline and waiting for a decent breeze to fill his sails. 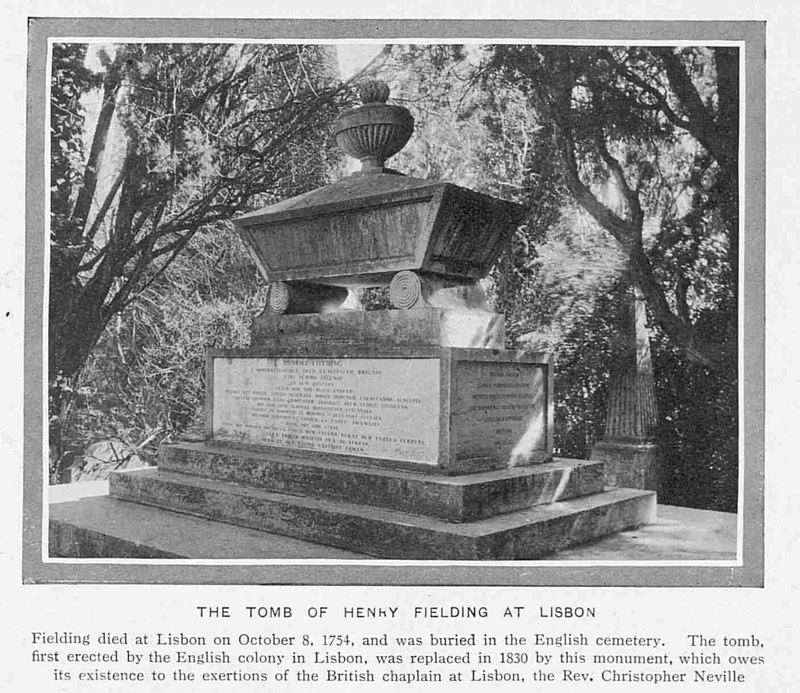 Fielding passed his time writing a diary that was published posthumously as ‘The Journal of a Voyage to Lisbon.’ Fielding may have been dying but he did his best to keep up his spirits and produce the sort of good humoured, rollicking prose in which he had written Tom Jones. He failed. Unsurprisingly he struggled to make light of incidents such as having to call a doctor to drain his stomach of ten quarts of dropsical fluid. A most tragical incident fell out this day at sea. While the ship was under sail, but making as will appear no great way, a kitten, one of four of the feline inhabitants of the cabin, fell from the window into the water: an alarm was immediately given to the captain, who was then upon deck, and received it with the utmost concern and many bitter oaths. He immediately gave orders to the steersman in favour of the poor thing, as he called it; the sails were instantly slackened, and all hands, as the phrase is, employed to recover the poor animal. I was, I own, extremely surprised at all this; less indeed at the captain's extreme tenderness than at his conceiving any possibility of success; for if puss had had nine thousand instead of nine lives, I concluded they had been all lost. The boatswain, however, had more sanguine hopes, for, having stripped himself of his jacket, breeches, and shirt, he leaped boldly into the water, and to my great astonishment in a few minutes returned to the ship, bearing the motionless animal in his mouth. Nor was this, I observed, a matter of such great difficulty as it appeared to my ignorance, and possibly may seem to that of my fresh-water reader. The kitten was now exposed to air and sun on the deck, where its life, of which it retained no symptoms, was despaired of by all. The Queen of Portugal finally docked at Lisbon at the beginning of August 1754. Approaching Lisbon on the river Tagus Fielding thought that it looked “very beautiful at a distance”; but was quickly disillusioned “as you approach nearer… all idea of beauty vanishes at once.” Soon he was calling it the “nastiest city in the world”. The blistering heat of August did nothing to mend the writers ailing constitution, just the opposite in fact, he was soon feeling worse than ever. Within two months he was dead, though the contrary British press, once keen to record his premature demise, perversely reported him as returning to full health under the Portuguese sun. 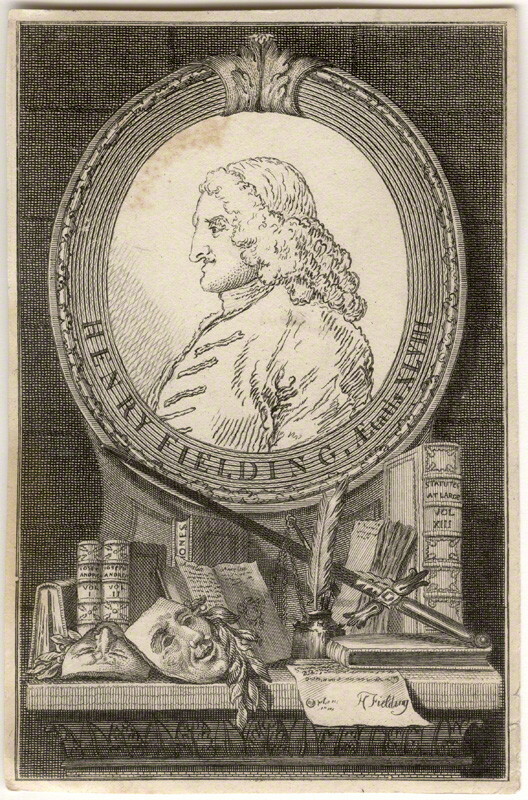 On the 22nd October the Leeds Intelligencer (now there is an oxymoron for you) told it’s readers that “Letters by the last Mail from Lisbon advise, that Henry Fielding, Esq; is surprisingly recovered since his Arrival in that Climate. His Gout has entirely left him, and his Appetite returned.” He had actually died on the 8th of October and had been interred in the only possible burial ground for a protestant foreigner, the English Cemetery. 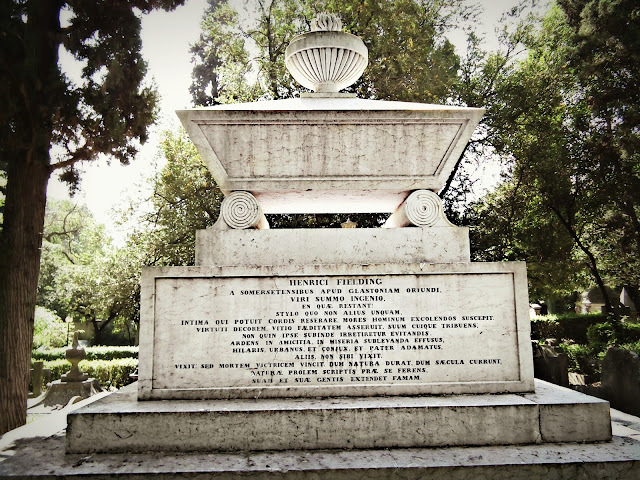 His death left his wife penniless and she returned to England without arranging for a headstone or any other grave marker for the great author. Certainly no one can complain these days, the cemetery in general and Fielding’s tomb in particular are immaculately kept. Make sure you visit if you are ever in Lisbon.